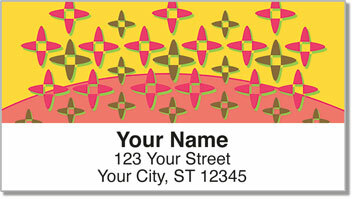 These fun-filled return address labels let you make a retro fashion statement that will look great on your outgoing mail! Funky star-shapes in cool colors take you back to a laidback time when Johnny Carson was the King of Late Night, pet rocks were all the rage and your bell-bottom jeans still fit perfectly. Retro Panel Address Labels from CheckAdvantage capture what's timeless about the classic styles of the sixties and seventies. Plus, you'll save yourself the hassle of preparing letters and packages for the postman thanks to a convenient self-adhesive backing. Get your very own Retro Panel Address Labels today. Don't forget to check out all our retro selections including matching personal checks this design.